It is with great sadness we announce the passing of Emily Frey of Central Butte, SK on Sunday, February 17th, 2019. Emily was born on the family farm at Fox Valley, SK on July 4th, 1933. She was the second youngest of 12 children. 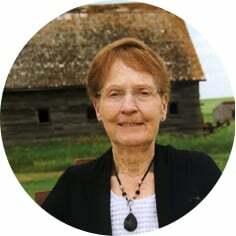 She married Walter Frey on May 28th, 1953 in Moose Jaw, SK at St. Joseph’s Catholic Church, and together they raised 4 children on the family farm north of Central Butte. She was predeceased by her husband, Walter in 2009; son, Randy in 2017; her parents and all of her siblings. Emily leaves to mourn, her children: Boyd, Reg, and Candace (Rod); daughter-in-law, Lillian (Randy); and her grandchildren and great-grandchildren. Emily and Wally had retired to Central Butte when leaving the farm. She enjoyed town life keeping busy with her flower gardens, going for walks, and coffee time with many friends uptown. She was very active with the Senior Centre activities that included curling and many different card games, as well as fundraising. Emily was a devout member of St. Mary’s Parish, helping out with donations of food for many functions throughout the years, as well as some of the duties of the church masses wherever she was comfortable. She enjoyed many shopping trips to the city and of course a meal out. Emily’s greatest passion was spending time with her family. She cherished all the visits, phone calls and special occasions with us and left us all with special memories. Once she began to have health issues, Emily moved into Iver Main in Central Butte in the fall of 2016 where she continued to live until her passing. While there, she met new friends and was reacquainted with old friends that she cherished her time with. The family wishes to thank all of the staff at Iver Main in Central Butte for their wonderful care and also to all the attending nurses and doctors on the second floor medicine in the Dr. F.H. Wigmore Regional Hospital in Moose Jaw for the support and care before mom’s passing. And a special thank you to Wrangler Hamm in emergency…we are so appreciative. The Funeral Mass will be celebrated on Saturday, April 27th, 2019 at 10:00 a.m. in St. Joseph’s Roman Catholic Church, 1064 3rd Ave NW, Moose Jaw, SK where Emily and Wally were married. Father Hector Seville will be the presiding celebrant and a private immediate family interment will take place at Sunset Cemetery. For those so wishing, donations in Emily’s name may be made to Iver Main Place Inc, Box 550, Central Butte, SK S0H 0T0. Arrangements are entrusted to Moose Jaw Funeral Home, 268 Mulberry Lane. James Murdock, Funeral Director 306-693-4550.